Democrat Anthony Rendon currently represents Assembly District 63 and will not be termed out until 2024. Rendon is expected to easily win re-election in 2016. Assemblymember Rendon currently serves as the chair of the Water, Parks & Wildlife Committee. He also serves as a member of the Joint Legislative Audit Committee; Public Employees, Retirement and Social Security; Local Government; and, Utilities & Commerce. 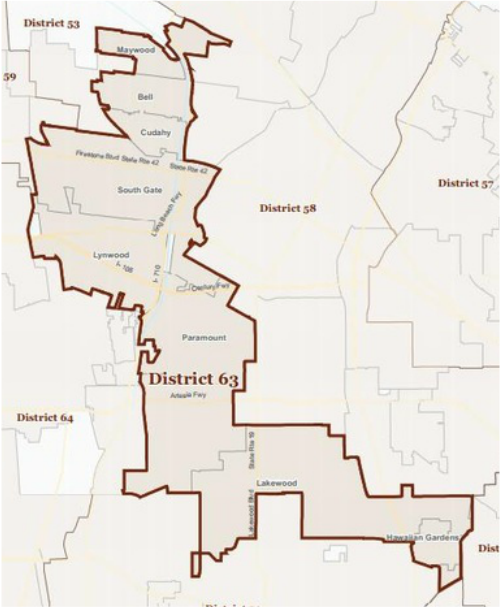 Assemblymember Rendon currently represents the 63rd Assembly District that includes the cities of Bell, Cudahy, Hawaiian Gardens, Lakewood, Lynwood, Maywood, Paramount, South Gate, and the community of North Long Beach. He has introduced legislation to enhance the state's ability to investigate financial fraud in local government, reduce exposure to poisonous lead in the environment, provide the public with greater access and transparency to local water providers, and improve early child care and education. Most significantly, he is the author of a statewide water bond that will provide $8 billion in funds to preserve rivers, wetlands, and watersheds while building and repairing the state’s outdated water infrastructure. Before serving in the Assembly, he was an educator, children’s non-profit executive director, and environmental activist. He was formerly the Executive Director of Plaza de la Raza Child Development Services Inc. “Plaza” provides comprehensive child development and social and medical services to over 2,300 children and families. These services are offered through Plaza’s 35 child development centers which are located throughout Los Angeles County. Before working at Plaza, ​​​​​​​​​​​​​​​​​​​​​He served as the Interim Executive Director of the California League of Conservation Voters (CLCV) from June 2008 to February 2009 where he helped pass SB 375 that was a first-in-the-nation law that gave local and state officials the tools to reduce greenhouse gas emissions by making housing and transportation planning decisions that will reduce urban sprawl, long-distance commutes and vehicle miles traveled per household. ​In addition, he worked to win passage of a bill which banned substances that contain cancer-causing perfluorinated compounds and another which allocated $400 million to build and expand neighborhood parks in communities like those in the 63rd Assembly District. He also worked to protect water quality by improving regional water and water systems and expanding the authority of the state’s Oil Spill Prevention and Response Program to inland water. He attended Cerritos Community College before earning his Bachelors and Masters of Arts Degrees from California State University, Fullerton. As a recipient of a National Endowment for the Humanities Fellowship, he earned his Ph.D. from the University of California, Riverside and completed post-doctoral work at Boston University. After completing his studies, he served as adjunct professor in the Department of Political Science and Criminal Justice at California State University, Fullerton from January 2001 to May 2008.